Gfive Bravo is a built-in storage which provided by Gfive it self. 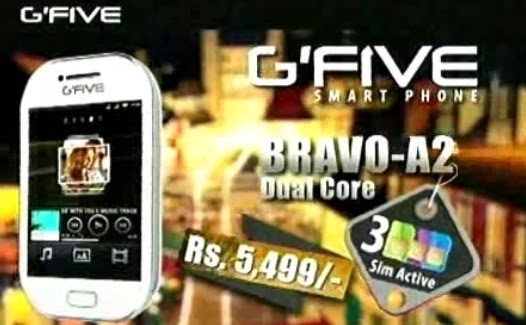 Gfive Bravo A2 is a smart-phone touch mobile which has Android 4.2 Jelly Bean, 3.5-inches screen with 1 GHz Dual Core but it has little memory 256 RAM and 256 ROM, 2 Mega-Pixel Camera with Flash LED(Back) and VGA Camera(Front).About battery Gfive Bravo A2 has 1500 mAh power. You can Activate 3 SIM's in Bravo A2. Bluetooth, Wi-Fi, GPRS, GPS, USB, microUSB (v 2.0), microSD Card Slot.